This year's National Eczema Week is from 17-25 September 2016. Atopic eczema (also known as dermatitis) is the most common form of eczema and often occurs in people who have allergies such as hay fever. A number of factors appear to play a part in the development of eczema. These include abnormalities in the inflammatory and allergy responses, and defects in the oily (lipid) skin barrier. This can lead to increased water loss and a tendency towards dry skin, and can make the skin more susceptible to irritation and infection, resulting in rashes and inflammation. Eczema symptoms usually have certain triggers such as soap, detergents, changing temperatures, dust, animal dander, pollens and moulds. Eczema symptoms vary from person to person and can affect any part of the body. It is important to avoid scratching affected skin as this increases the likelihood of infection and skin damage. Treatment strategies usually focus on avoiding trigger factors and keeping skin well hydrated with emollients and moisturisers. DB Reviews in collaboration with SEQuaderma is giving the readers of this blog the chance to win one of the following two products from the brand. 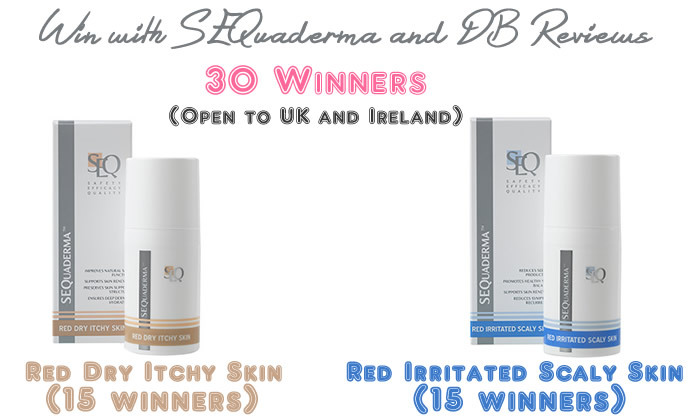 There will be 30 winners in total - 15 receiving one Red Dry Itchy Skin Serum each and the other 15 receiving one Red Irritated Scaly Skin Serum each. SEQuaderma Red Dry Itchy Skin - Skin ultra repair serum for the care of atopic and hand eczema. SEQuaderma Red Irritated Scaly Skin - Seborrhoea cleaning skin serum for the care of symptoms of seborrheic dermatitis. - Clinically proven to restore your skin comfort and well-being. - Tested under dermatological control on hundreds of women and men across a variety of ethnicities, ages and skin types. - Long-term solution that avoids the side-effects that most prescribed medicines may cause. - Uses award-winning nano-delivery system to hydrate your skin and support its natural recovery process. - Kind to your skin and will not increase its sensitivity. - FREE from artificial fragrances, colourants, oil, Methylisothiazoline (MI), sulphate or propyl and butyl parabens. - Formulated with optimised pH, pure water and minimal possible number of ingredients to minimalize the risk of skin irritation. - Easy-to-use serum that can fit into your daily beauty or skincare routine and be used alongside other products. For your chance to win, enter using the app below. All the best! Thanks to all those who entered. The giveaway has come to an end and 30 lucky winners have been selected. Winners will receive an email from SEQuaderma and need to respond within 7 days of receipt of email to claim their prize. Yes, wear cotton fabrics when you can, bathe in a warm bath and pat skin dry. Use products that are specifically for eczema prone skin eg suncream, bubble bath, soaps and moisturisers. My best friend swears by using little organza bags filled with pure porridge oats in the bath. She uses that on her kids and it seems to help. Obviously make sure the bags are ties tightly so that you don't end up bathing in porridge! Keep up the moisturisation and if you can't avoid allergens (which does happen) take antihistamines to help with the itching. you have keep moisturising other wise it will get so much worse. I find usually more natural products helps out alot and also avoiding things with fragrance or synethic ingriedents for the most part. Moisturise, moisturise, moisturise! Keep the skin fully hydrated with the best products for your skin type. Moisturise as often as you can but be careful what products you use. It is all about finding a cream that helps reduce it. I wish I did. It's so annoying. My son has bad eczema on his hands and legs, I would say the things that seem to improve it are wearing natural fibres and oat baths! try and not to scratch, I need some idea's as I get it on my scalp really bad, I have not found anything to help it yet.